This book illustrates manual therapy techniques for the lower quadrant covering assessment and treatment techniques for the lumbar spine, pelvis, and the lower extremity. Each technique is illustrated and is accompanied by an easy to read description. The final section of the book looks at manipulation techniques for the lower extremity peripheral joints, and introduces manipulation in the lumbar spine. The intent of this book is to provide a base of techniques from which manual therapy principles can be applied and is not meant to be exclusive of other manual therapy techniques. 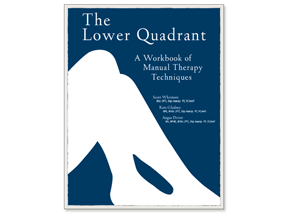 Students and teachers will find this a useful reference tool while learning and applying manual therapy techniques in the lower quadrant. ORDER THE LOWER QUADRANT MANUAL NOW! Download a pdf form to mail in your order.